It’s fall! It’s hard to believe the season is already upon us. I am so excited for the cooler weather and fun fall activities with my family. Fall is definitely one of my favorite seasons. 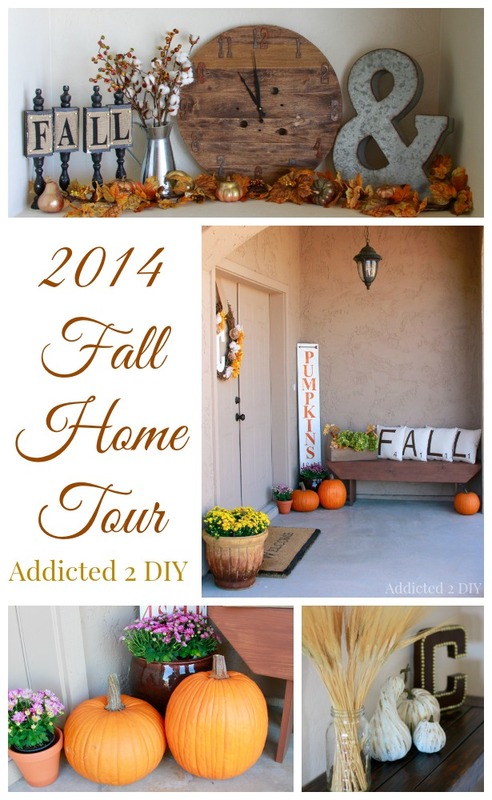 This year, I’m teaming up with over 35 different bloggers and opening up our homes to you in a fall home tour series. Yesterday, there were some gorgeous homes that were shared, and I can’t wait to see the rest. You’ll find all of the information for these tours at the end of this post. 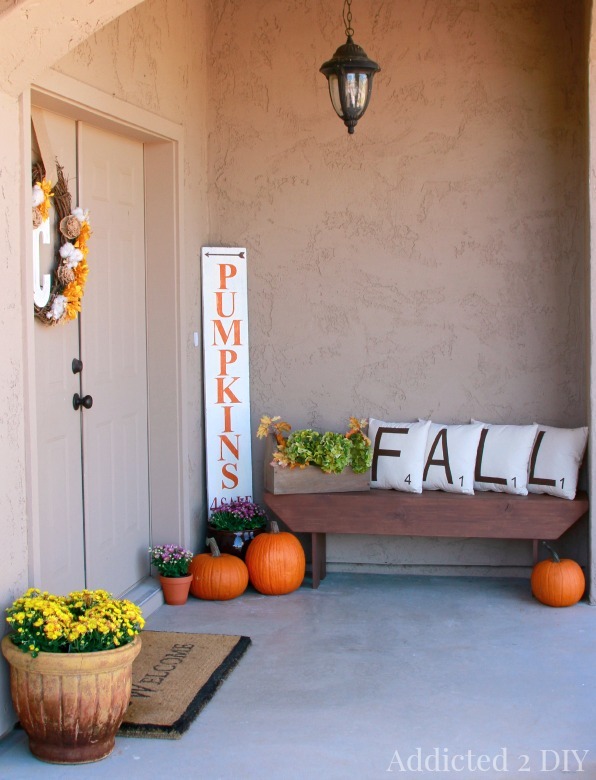 I have always dreamed of a gorgeous fall porch. This is actually my very first year decorating my porch for fall and I am in love with it! My PUMPKINS sign was a perfect (almost free) project that I made using things I already had on hand. The Scrabble Tile Fall Pillows I made go perfectly on my new rustic bench. Be sure to check out my post on the pillows to see the special surprise on the other side of them. I love the colors of fall and I was so excited to finally start seeing pumpkins in the grocery stores. 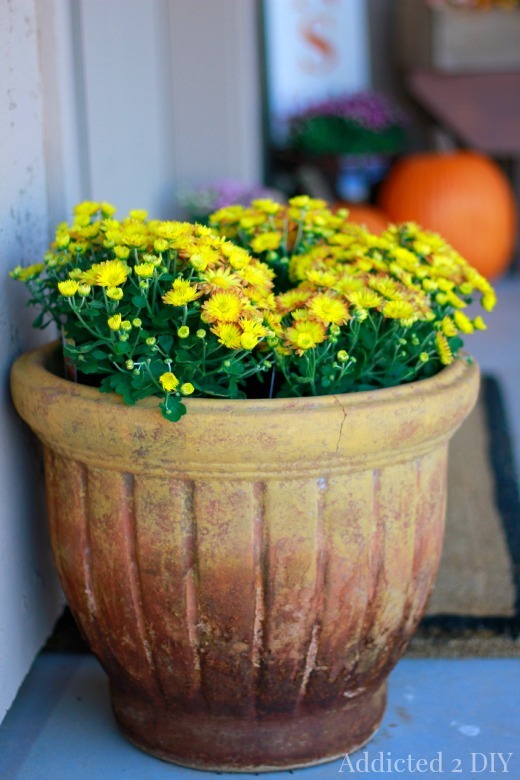 And these gorgeous mums were on sale at Home Depot for only $.88 each! I bought tons of them. 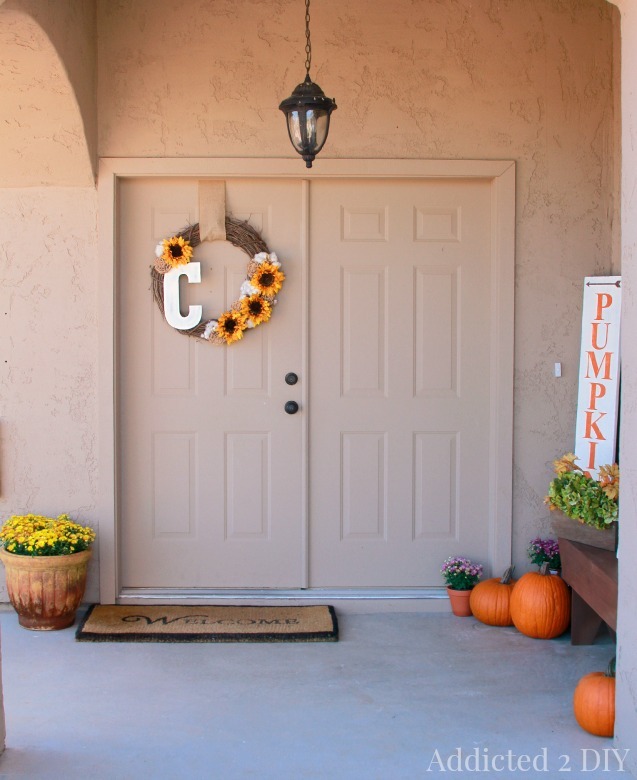 There’s just something so warm and welcoming about a decorated porch. The fall monogram wreath welcomes our guests but also has a sentimental feeling to it with the cotton clusters. Stepping inside the house, our entry way is decorated with neutral fall colors with a bit of a metallic touch from things like my gilded gourds. I wanted to add some framed art to the shelf above our console table, so I found and created some free art. Most of the printables can be found at On Sutton Place. The one on the far left is from Creative Cain Cabin. The three stacked pictures are water color images I created myself using the Waterlogue. 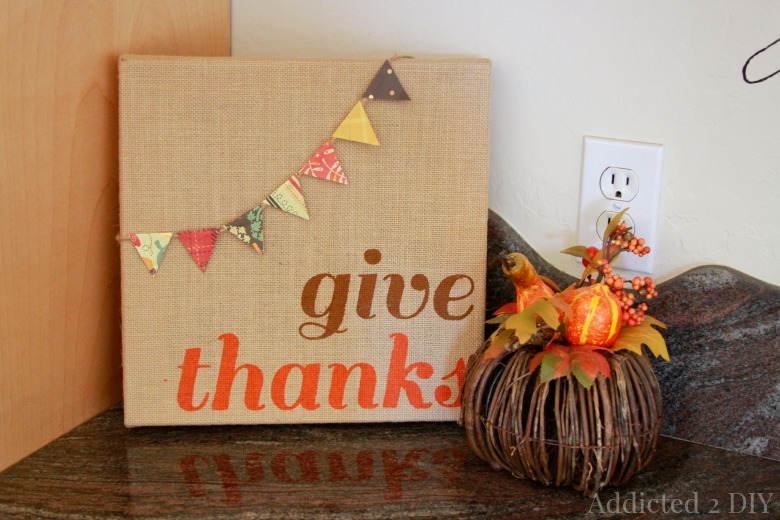 I just grabbed a few of my fall decor items from around the house and snapped some pictures. They came out so perfect for this project. Once again, you can’t beat free! We never host Thanksgiving, so I don’t ever decorate the table much for fall. Since this is our only dining table, I wanted to go with something simple that could be moved out of the way during meal time, game night, etc. Last year, I created this simple DIY fall centerpiece using some pieces of scrap wood as well as acorns and leaves that I found when we had gone camping last fall. It was the very first fall project I had ever done and I love how it looks. Plus I can change it up when it’s Christmas time. 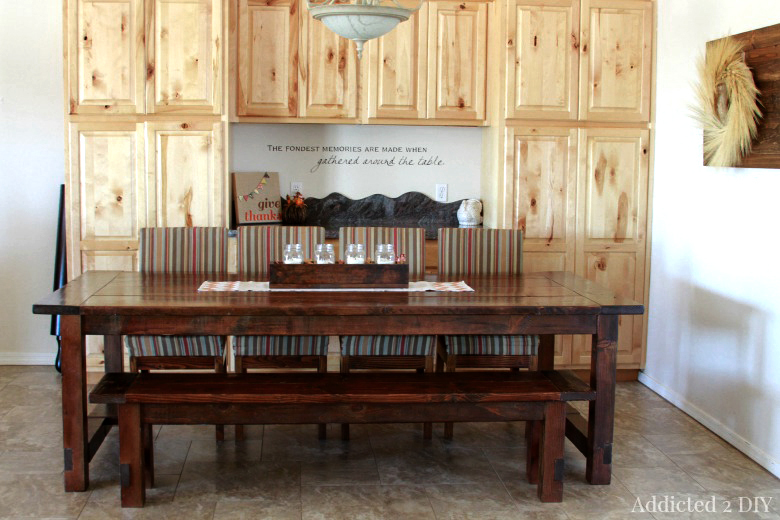 This wood plank wall hanging is a new addition to the dining room. I love how rustic it looks. Plus it’s versatile. 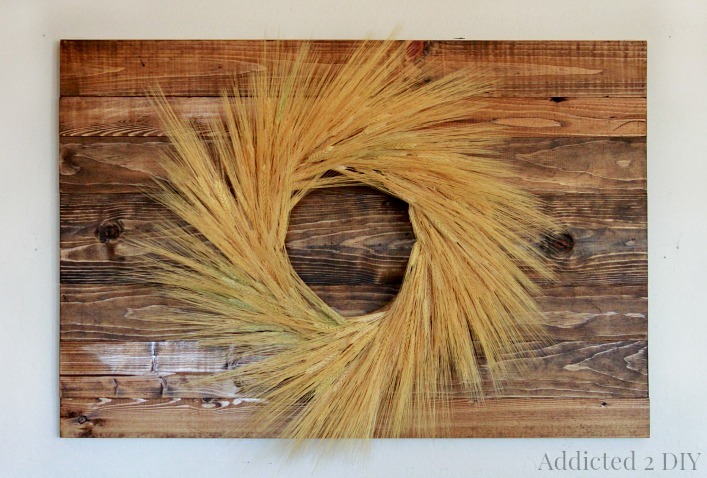 I made this wheat wreath for fall, and I can make other seasonal wreaths to hang from it. To accent the bar area behind the dining table, I set my burlap burlap canvas art. It was another frugal project using mostly items I already had on hand. Decorating and saving money are always nice, aren’t they:) I also scored a Tom the Turkey Scentsy warmer last year for super cheap and he hangs out on the other corner of this bar area. In our large built-in entertainment center, we have a huge niche. 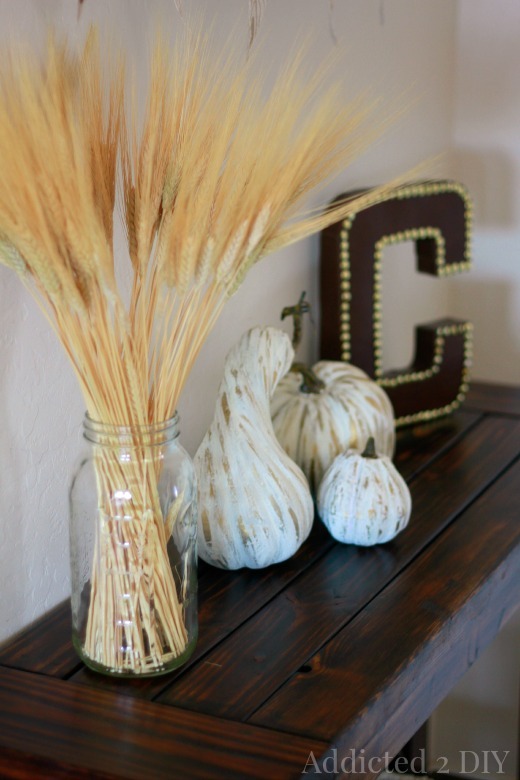 I would always decorate it for winter, but this year I created this fall vignette. I bought the ampersand at Hobby Lobby. I didn’t know where it would go at the time, but I knew I had to have it. The wood block and candlestick decor are a repurposed projected that I’ll be sharing with you later this week. The wooden clock is a brand new project that I just finished. 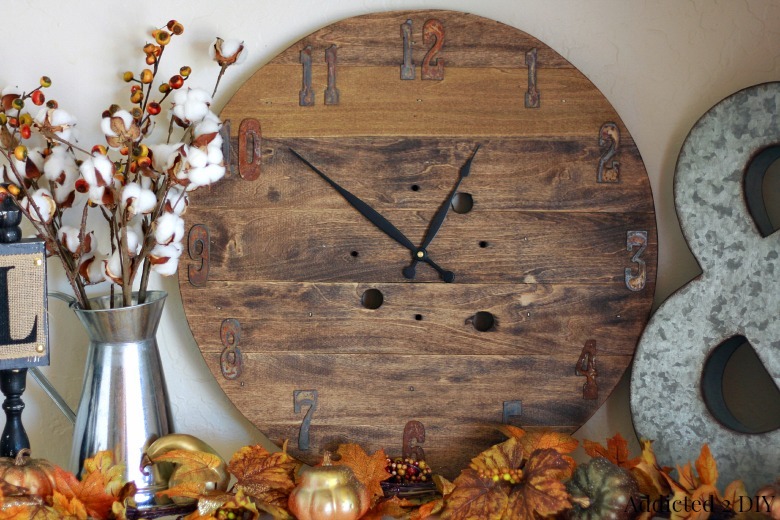 I’ve always thought a clock would look so good in there, and this fits in perfectly with my neutral/rustic fall decor. I am in love with the rusty patina on the metal numbers I bought. That tutorial will be coming soon as well! So what do you think? 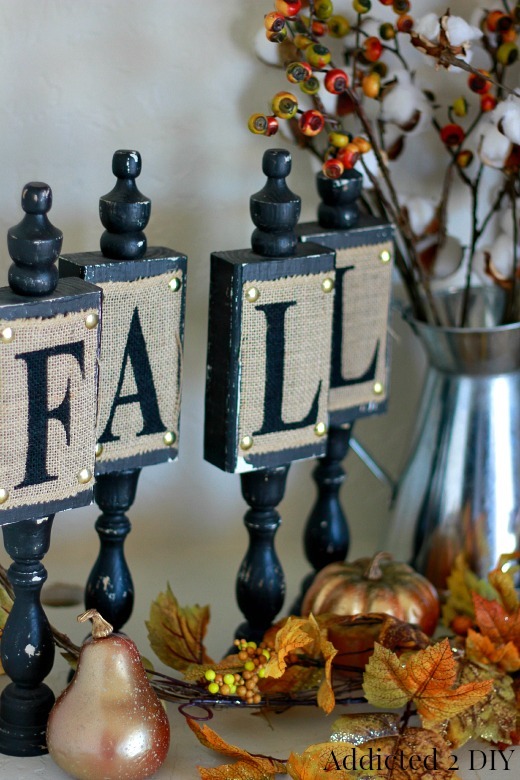 Do you decorate your home for fall, are you counting down the days until you can put the Christmas decorations up? Now it’s time to visit the homes of the other very talented bloggers in this home tour series! Some of them have already shared their homes and others will be sharing them as the week goes on, so be sure to check back throughout the week! Beautiful home…I love your double front doors…fantastic! 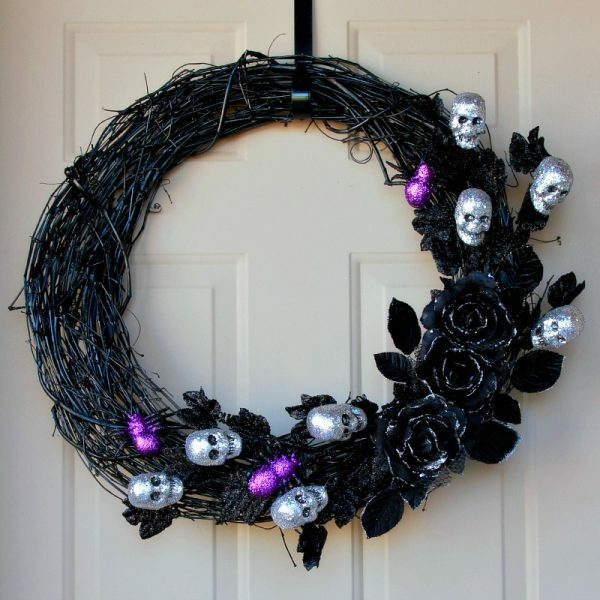 Awesome decorations! I love your signs and front porch, so cute!! 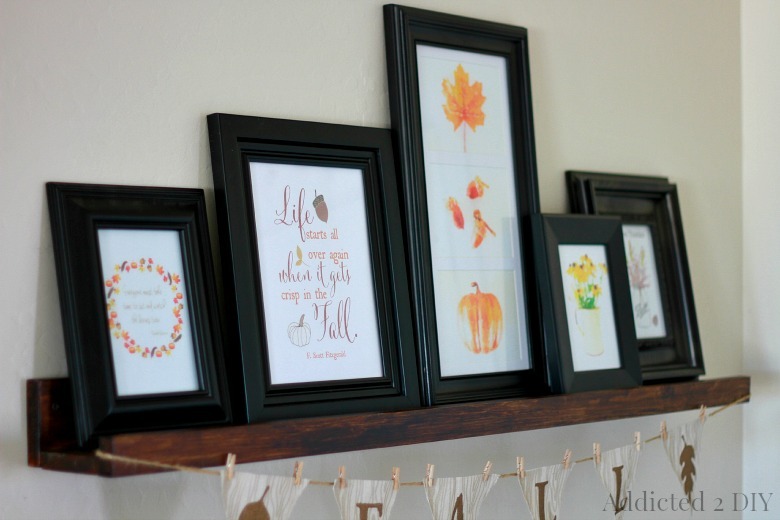 The printables you found for your picture ledge are perfect above your console table! You already know how I feel about the porch. I’m coming to take everything off of it for my house! You have such a beautiful home! I love how you decorated your front porch and the niche in your entertainment system. I’m looking forward to hearing more about your candlestick project, they are fabulous! 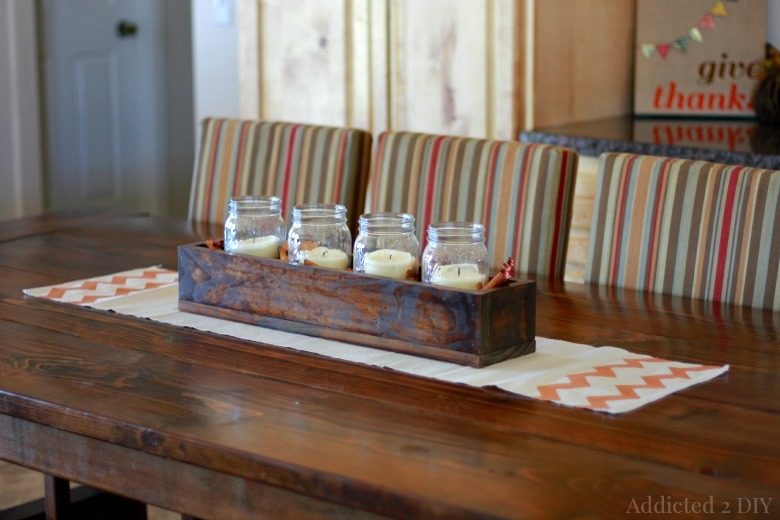 Love how u decorated ur home for the fall season using items u made! 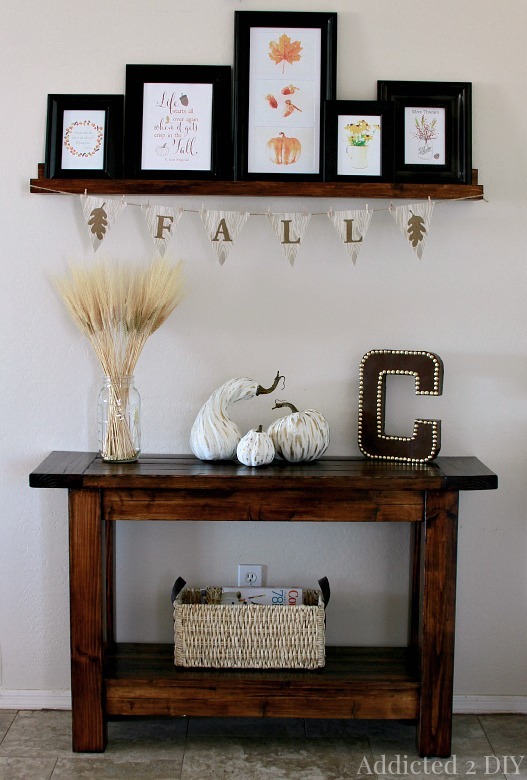 Something about fall decorating that makes a home even more welcoming! Katie your porch is amazing! The whole house is stunning 🙂 Thank you for sharing!! I love your tour! Those scrabble tile pillows are so cute! 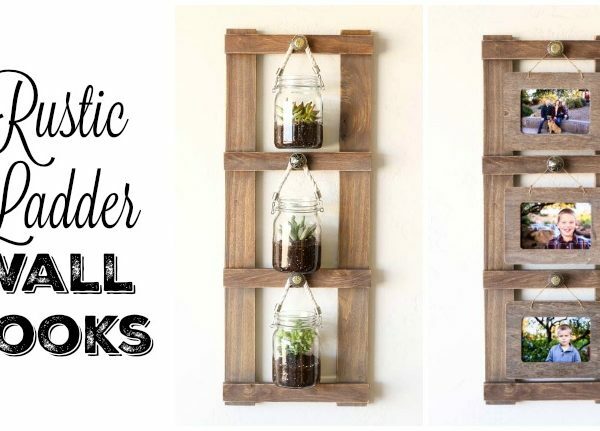 Love your home and the plank wall! 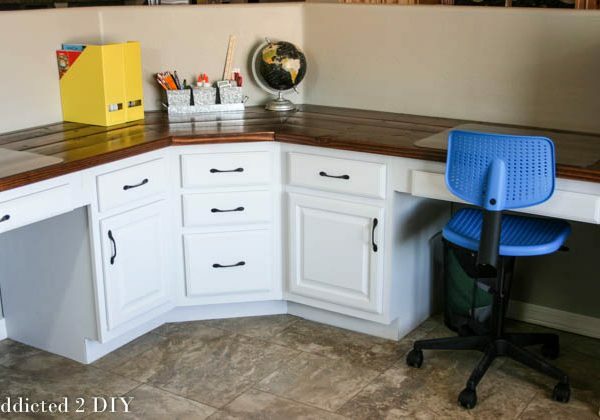 Katie, I am in love with your home and all of your DIY projects! 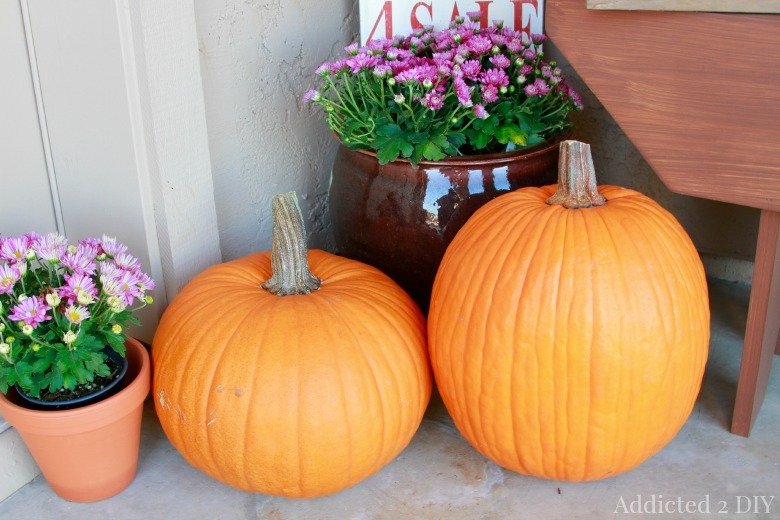 Your front porch is decorated so perfectly for fall and I LOVE those scrabble pillows! I’m also loving that waterlogue art you created and that clock turned out AMAZING! LOVE the Scrabble pillows!!! So cute! LOVE your home! Those scrabble pillows are so fun! Katie- I love your home tour!! So pretty! 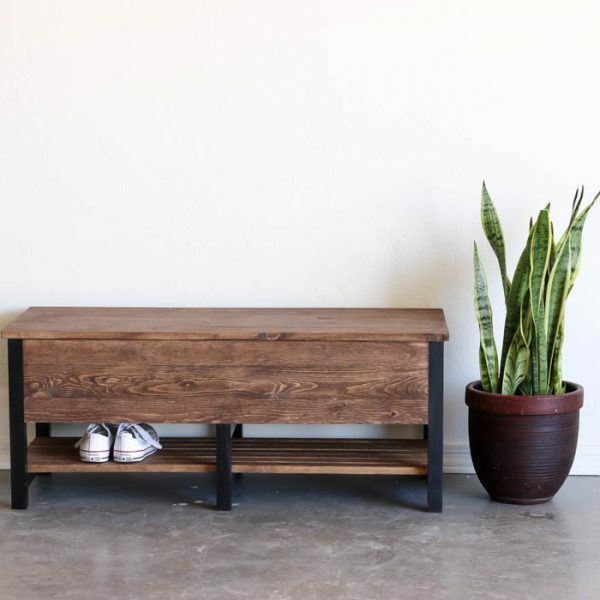 Your fall front porch is incredible…and I love all your handmade touches scattered throughout your beautiful little vignettes. Thanks for sharing your tour! Thank you for sharing your beautiful home with us, Katie! I LOVE that wood plank hanging with the wreath! And that wooden clock is adorable! Pinning!